We manufacture clutch inspection covers for the ENV manual gearbox, as fitted to the F Type, C Type and J4 (for other bell housings see below). It is worth noting that the original patterns used by ENV when making manual gearbox cases incorporated variations. One such variation relates to the apertures of the raised clutch inspection hatch area. 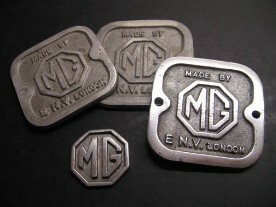 If you are using an ENV manual gearbox which has either a plain case, AC or Invicta motif then please measure the hatch area before ordering as it may differ slightly to the standard MG size. We may be able to match up a cover for you if this is the case. Please note that the above inspection plate may be undersize when used on a preselector clutch housing. Where a preselector gearbox is being fitted, a separate bell housing will be used and many of these have an oversize inspection hatch area measuring 3 3/4 x 3 5/8 inch (although with standard 3 inch hole centres). We now produce an oversize ENV inspection cover plate for this application. The above photo also shows an MG badge faithfully copied from an F Type gearbox with the wooden pattern made from 19 pieces of wood! The badge is slightly dished to allow it to be attached to the side of the AC / Invicta and plain case crosstube gearboxes to give a C / J4 appearance. We will manufacture another small batch on receiving the next order. Standard later 'vented' style J, P, L and N clutch bell housing inspection plates are currently being manufactured and will be available shortly. We also supply Wellseal jointing compound.